Xilamuren (xī lā mù rén 希拉穆仁), which means "yellow water" in Mongolian, is also known as Zhaohe (zhào hé 召河). Lying about ninety kilometers (about 56 miles) north of Hohhot (hū hé hào tè 呼和浩特), Xilamuren Grassland is the nearest grassland tourist attraction to Hohhot and the earliest one that developed in Inner Mongolia. 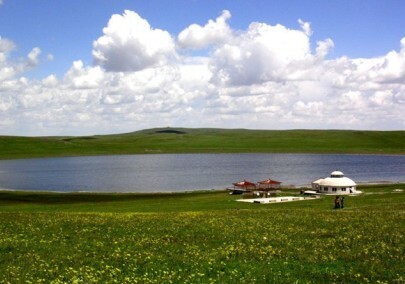 Xilamuren grassland is a famous resort to escape from the hot summer. The average temperature here in July and August is 18℃ to 21℃. It’s very cool in the morning and evening. 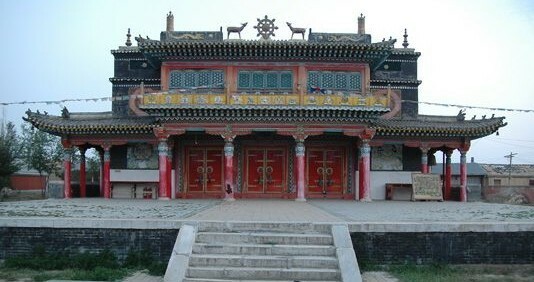 Xilamuren Grassland is commonly known as Zhaohe, got its name for Puhui Temple (pǔ huì sì 普会寺), a Lama temple built in the Qing dynasty near Xilamuren River. Constructed in 1769 during the reign of Emperor Qianlong, Puhui Temple was initially a resort of the sixth Xilituzhao living Buddha (xí lì tú zhào liù shì huó fó 席力图召六世活佛). Now it is a complex of three halls with carved ceilings and painted beams. The beautiful Xilamuren River surrounds the temple, presenting a peaceful and harmonious atmosphere. A day trip to the Grasslands may provide visitors with some pretty pictures, but to truly understand the experience one should be prepared to stay for at least a day or two in a traditional Mongolian tent, called a 'yurt'. The yurts are wooden-framed tents covered in felt made from compressed sheep wool and thickly lined with padded blankets, sheep-skin rugs, handmade quilts and embroidered pillows, designed to be packed up quickly and carried by camel with the nomadic tribesmen. Modern yurts (particularly those in the approved tourist areas) are more permanent structures, built on concrete in small camps occasionally equipped with hot water and electric lights. 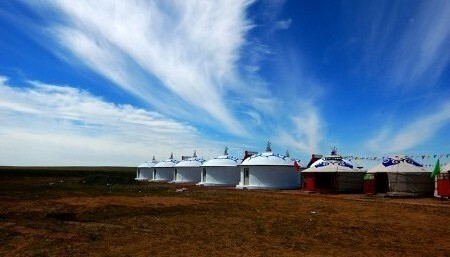 There are 62 Mongolian yurts, among which 30 Mongolian yurts are standard. Visiting one of the many Aobaos on the Mongolian Steppes during festival time is an unforgettable experience. The Aobaos are heaps of stone which originally served as markers to guide the way for nomads across the massive grasslands. As time went on, the markers understandably became meeting places (’’meet you at the third Aobao...’’) especially for young lovers, for whom the steppes must seem particularly large when their paths cross so rarely. 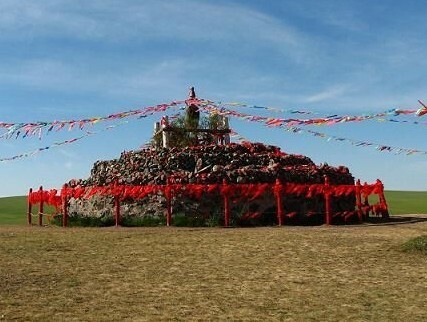 The Aobaos began to be used as shrines to heroes of various wars that took place in ancient Mongolia; artifacts such as the hero’s sword would be placed in amongst the stones and people would bring sacrifices to them. The tradition of sacrificing at the Aobaos has continued and it is now their primary function. Corn, meat, fruit and alcohol are dedicated to the gods of the sky, the gods of the earth and tribal ancestors to celebrate the birth of a new child, weddings and good harvests. 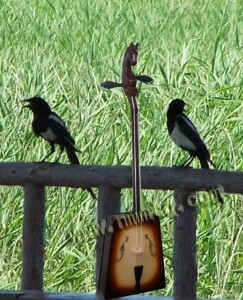 During summer when the crops are lush and the animals grow fat, the Aobaos see many visitors. Rituals lasting several days take place at the Aobaos, which are swathed in white cloth as invited Lamas and Buddhist teachers speak and intricate dances are performed. 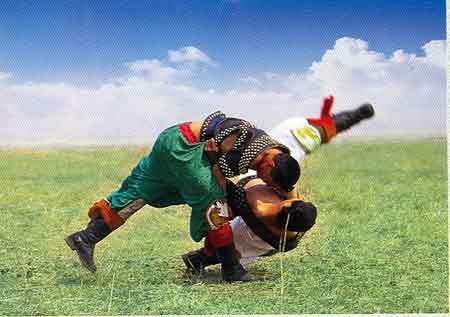 Visitors to the grasslands should not miss out traditional entertainments of the Mongolian steppe. The most popular are the “Men’s Three Skills’’ of wrestling, horse racing and archery, which are seen as the most important skills for a man to possess. Every year during the most important festival in the Mongolian calendar - Nadam - the tribesmen will compete in these pursuits, but all year round they will demonstrate their skills and encourage visitors to join them. Meal times provide a great deal of entertainment too. Whole sheep are roasted by the herdsmen, mutton is boiled in a stew-like dish called Shoupa Rou (shǒu pá ròu 手扒肉) which is eaten with the hands and several dishes made from mare’s milk are shared including milky tea and milky bean curd. The dinner normally ends with dancing and singing of toasting songs accompanied by Mongolian instruments, such as the Matouqin (mǎ tóu qín 马头琴), a fiddle whose scroll is carved into the shape of a horse’s head. 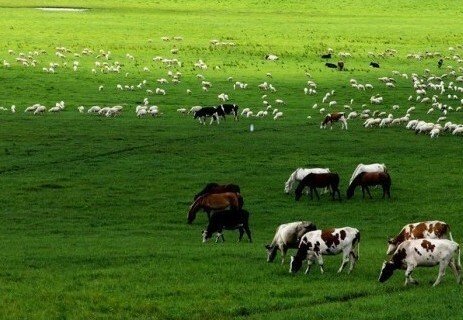 The best time to visit the grassland is in summer and autumn. At this time of year, the pleasant climate, the blue sky and white clouds, the rolling grass, the wandering flocks and herds, the passionate herdsmen and their Mongolian food will undoubtedly leave you with a deep impression. What’s more, during the Nadam Festival held every summer, tourists can enjoy a series of different activities, including camel riding, horse racing, wrestling, archery, a camp fire party and singing and dancing. You can even take part in some of the competitions that you are interested in. There is a 7:50 a.m. bus leaving for Xilamuren from the train station, which costs CNY 14 and returns at 3 p.m., but the easiest way to visit the grasslands will be taking any one of the numerous grasslands tours on offer, which can be organized by some hotels. Another option is to catch a bus from the long-distance bus station to Zhaohe (Xilamuren grassland), which will leave twice one day and be a bargain at CNY 8. Location: Ninety kilometers (about 56 miles) north of Hohhot.